Progress is blooming in Noxubee County, and the proof is in the cabbage...and the broccoli and the turnips and a variety of other vegetables growing this winter in a community garden at Earl Nash Elementary School in Macon. That garden, planted spring 2017 by the Noxubee County Diabetes Coalition, is part of an effort to promote healthier lifestyles among county residents, starting with some of its youngest. Though coalition members tended to the garden during summer months, Earl Nash’s third-graders were the first kids to care for the raised garden bed when school resumed in August. “Every single [third-grader at Earl Nash Elementary] either planted a seed or planted a plant,” said Crayton Coleman, coalition member and an agent with the Mississippi State Extension Service. Coleman hopes the kids will take home what they learn, get their families’ involved and want to plant smaller gardens of their own. He praised the “community buy-in,” noting donations from area companies and organizations. The current garden is located next to Earl Nash Elementary’s playground, and Noxubee County residents may pick available produce whenever a craving for fresh food calls. The Diabetes Coalition chose Earl Nash as its premier garden site, Coleman said, because the school’s recently retired principal was an avid gardener, and the campus is centrally located in the county of just over 11,000 people. Coleman expects many more gardens to follow. Next stop: Virgil Jones Jr. Elementary School in Brooksville. 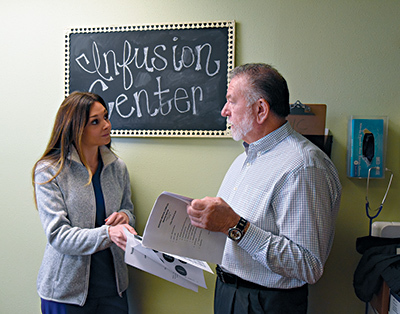 Danny McKay, Noxubee Medical Complex CEO, said his hospital plans to join the healthy lifestyle initiative, looking to provide more preventative care to county citizens. McKay said the Noxubee hospital — which employees just over 200 people — is acquiring the old 17-acre Central Academy site. The former private school closed last year. The hospital’s bid for the site, McKay said, is just under $250,000, and he expected the sale to close in late February 2018. A wellness campus, which could include an assisted living facility, adult day care, a used medical equipment depository, a community-access clinic and another community garden have been brainstormed for the site. “We’re completing a community health needs assessment, and we’re at the stage now where we’re going out with the community leaders and getting them to contact their spheres of influence to find out through an online survey what they perceive would improve the quality of life here,” McKay said. McKay said the hospital will explore grant funding for some projects, especially ones aimed at promoting health education.